» Promotion’s OK but free speech isn’t? Promotion’s OK but free speech isn’t? 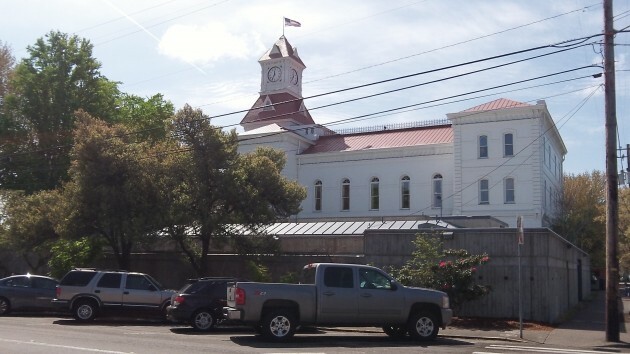 The low concrete fortress next to the Benton courthouse houses the jail. Something is definitely screwy with Oregon’s election law and how it’s being enforced, and the news from Albany and Corvallis points this out. Free speech is the main issue, but so is the penchant by local government to try to affect the outcome when people are asked to vote on higher taxes. On the one hand we have Albany, where the state elections office sought to fine the city manager $75 for merely having mentioned in a press release that a bond election was being held without also repeating how much the tax would cost. To his credit, the city attorney is fighting the fine on the grounds that the regulation on which it is based is a gross violation of the Oregon constitutional right to speak and write freely on “any subject whatever.” A hearing before an administrative law judge is scheduled in Salem on May 6. On the other hand, in Corvallis the Benton County Board of Commissioners has just decided to hire a Eugene public relations firm to help lay the groundwork for passage of a likely jail construction bond measure in 2015. The Corvallis paper reports that the contract will cost at least $43,500 and, if extended to include additional work, may reach nearly $100,000. What is that work? The county describes it as voter education. That’s fuzzy-speak for a campaign to pass a bond measure of probably $20 million or more to pay for a new Benton County jail. So on the one hand it’s supposedly unlawful, according to the Elections Division, for a city manager merely to point out that an election is in progress, and on the other it’s OK for a local government to spend a pile of money to try to win passage of a bond measure. The public entrance of the Benton County Jail. Now, to be fair, Benton County has not yet actually placed a measure on the ballot. But the commissioners anticipate doing so, because a new jail is obviously needed. 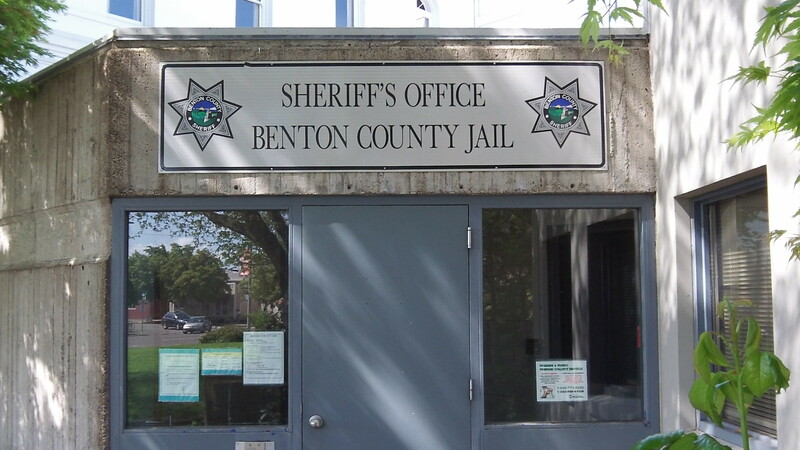 With 40 bunks, the Benton lockup is far too small and the county spends about $1 million a year placing inmates in rented beds in other jails. But if the need is that obvious, why spend scarce funds on a public relations effort to persuade voters? Especially in a county that doesn’t have enough money for road repairs and whose population likes to think of itself as generally richer, healthier and smarter than the rest of the state? What does Wes Hare and our illustrious city attorney have against the government being open and transparent anyways!? What are they trying to hide? Are they above the laws that help to foment openess and transparency? If Hare did nothing wrong – then why the fine? You think its okay for city employees to engage in political activity while on the job during work hours? If the city wins, I’m going to recruit some city employees to wear buttons that say, “Anybody but Konopa for Mayor in 2014” Also, I’m going to recruit library employees to point to the button and verbalize this political stance every time a patron checks out a book. Let’s really test the city’s commitment to “free speech” during a political campaign. I suspect the Mayor and the City Manager would squash this form of “free speech” in about two seconds. I don’t see how you can separate the rule from the law. As with every government rule, a violation of the rule is enforced as a violation of the law. And good luck claiming SoS “overreach” before a judge. “Overreach” is a legal concept meaning “exploiting a situation through fraud or unconscionable conduct (West’s Encyclopedia of American Law, edition 2). Is the city claiming the SoS exploited the Wes Hare through fraud or unconscionable conduct? Hare violated the law/rule by unintentionally omitting required information from the press release. In other words, he admitted being ignorant of the law/rule. Now he claims through the city attorney that his ignorant omission was an act of “free speech”? And his “free speech” rights were violated due to SoS “overreach”? Please amplify and help us understand these novel legal assertions. They make no sense to me. Hasso–you are really missing the point of the decision by the SOS citation. The City council tried to get the voters to approve the $20M bond measure by stating they would create an overview cmte if the measure were passed. Then they got Wes to write a press release to that effect. He did that while at his normal job while the voting was being done.. That’s the violation. I don’t want to pay any public employee to be an advocate for any measure while they are at work. The citation was written in a somewhat oblique way but the law against advocacy by City employees seeking to benefit their own work life must be upheld. The fireman’s union donated $1000 to the Councils PAC because they want taxpayer money to build them a better firehall was a legal way to influence but the on-the-job advocacy by city manager and paid information officer was not. That “free” speech was “paid-for” speech and illegally done. Having made three errors and paid three fines in this same election, I would agree that some of the regulations are difficult to understand. The solution, as I see it, is to go to the source of the regulations, the Oregon Legislator. They are the ones that created the rules. This issue however, is relatively simple. Wes Hare was required by this set of regulations to provide financial impact with in his news release. I don’t know if it was an oversight or deliberate. It makes no difference; the reason the rule is the rule. In conclusion, Wes Hare should just “cowboy up,” pay the fine and move on. Wes did “cowboy up.” He was going to pay it until 100% of the councilors said they would pay it for him – and then the city attorney said he would take on the decision 100% pro bono… It is another case of common sense over what is written – and the law needs to be challenged. It now has been.